Gear S allows user to enjoy real freedom by delivering smart mobile experience without a smartphone in hand. Fashionable. Comfortable. Convenient. Samsung Gear S keeps you in touch and informed when you re not carrying your phone. The wearable connects directly to the powerful Verizon network, letting you make and answer calls, check and send texts, get directions, track your run and more. All from your wrist. The Gear S is available in Black or White. 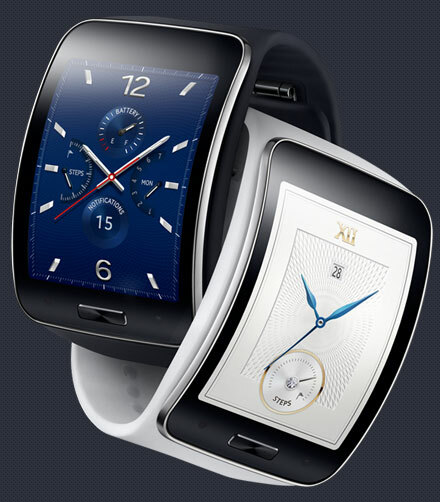 Samsung Gear S designed with an elegant curved Super AMOLED display for a comfortable fit. Customizable screen clock faces and changeable straps helps to express your own style. Enjoy rich views with a beautiful and easy-to-use user interface which allows access to relevant information and notification at ease.